Linux Mint 11 LXDE released! 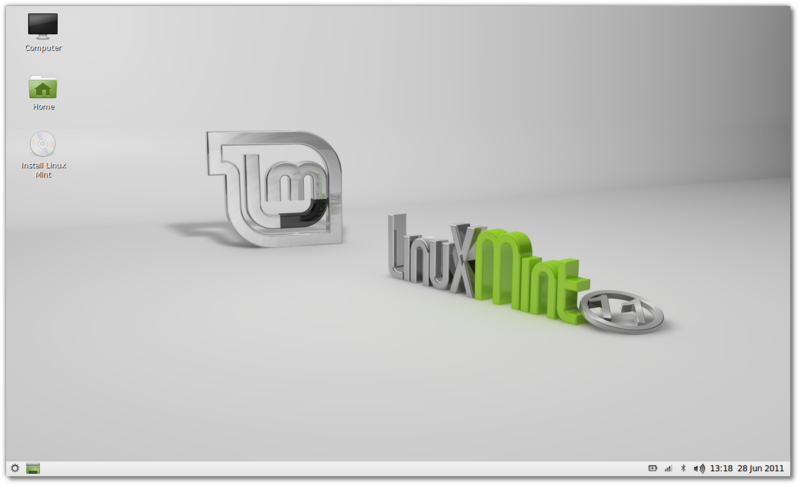 The team is proud to announce the release of Linux Mint 11 LXDE. To upgrade from Linux Mint 11 LXDE RC1 or RC2, simply apply any level 1 and 2 updates (if any) available in the Update Manager. Next Next post: Linux Mint Debian 201108 RC (Gnome and Xfce) released! And is there a 64-bit edition? Awesome! When will we see the new LMDE re-spins with the new update manager goodness? Great job! Thanks alot! Kendall – wtg! Waiting with impatience for debianized Mint Flux. btw, how about the battery monitor? Great news! I hope the double Updater icon problem is fixed that I had on the release candidate. I wonder if it will not have many updates to do, because I have internet through a linux mint ruim.quando left lxde julia came with too many updates to fazer.gosto linux mint, but has a lot of updating. Nice to see that LM 11 LXDE has been released. But we are anxiously waiting for the re-spin of LMDE amd64 as soon as possible. Because I’d like to re-install the LMDE on my system using the new ISOs. LMDE is really wonderful and I can see it’s bright future ahead. Once again I would like to urge the Linux Mint Team to prioritise LMDE and you would surely get increased response and acceptance from people around the world. I still don’t have cursor at login and Still get two copies of mint-update in the panel. So far is all I noticed. apparently I fixed the two mint-updates showing up. I had added xcompmgr to /etc/xdg/lxsession/Mint-LXDE/autostart after @/usr/lib/linuxmint/mintUpload/launch-file-uploader.py and that seems to have been my problem. I moved it before it and all is fine. I have been using the rc for many weeks now on my old Thinkpad x40(installed to a 8gb sdd drive) Will the release candidate become the final edition by updating or will I need to do a fresh install? Great work I must say! Thanks! Very interesting. However I am still waiting for the KDE version of Linux Mint 11. Is there going to be an AMD64 [x64] build of LM 11 LXDE? Clem posted on July 11th, which means a little more than a month ago now, in the blog post “Upcoming releases”, that “after the installer is ready we’ll work on respinning new LMDE ISOs for Gnome and Xfce before focusing on Linux Mint 12” and they are not announcing release dates for the both respins of LDME although both were in testing for already 3 weeks at that time, for having time to make some important decisions and releasing a system that makes fun to use and the developers could be proud on delivering. And he said, too, that a KDE edition based on LMDE maybe could be ready for release in August. So I expect the respins for somewhat around that time, too. Correct me if I’m absolutly wrong with this expectation! and then updating your system with the update manager. Afterwards you should have running LMDE on the new update method. This should work without reinstall, too. For me at least it did. All my hope for the future use of Mint in now on the LXDE version. Because Debian-based is much too complicated for non-experts, and Gnome 3 doesn’t work on old computers. So please always keep LXDE version based on Ubuntu. If that too disappears, we have nothing left. That’s FUD that Ubuntu people spread. Canonical is a company that depends on popularity and that’s not the only way they try to tread on the “competition”. I might have to install LXDE on my machine to try out the desktop. I have been using KDE a lot because the GNOME 2 has a problem with panel items being not added when first booting up. I guess I’m too impatient to find the correct permanent fix for that bug. Excellent! VERY glad to see the ‘installing on a JFS parition’ bug has been addressed! Nice work! That being said, what could possibly be easier than a debian based distro? .RPM is a dismal failure and I’ve never been stuck in dependency hell with a .DEB package. Maybe someone could enlighten me? Thanks for another great Mint flavor, I look forward to trying it! This is the best version of Mint available IMO. Non utilisateur, je la partage sur transmission. Bon boulot comme d’habitude. Merci ! but what is interesting me very much more, will there be a x64 KDE flavour of Mint 11? Or do I have to wait till the 12? Merci beaucoup, ce sera l’OS de mes élèves à la rentrée. Thanks a lot, Mint LXDE 11 will be the OS for my students. How to convert Mint Linux 11 Gnome Edition into this LXDE Edition? You are great! Has just installs on a second computer, and I highly recommend to all! this is what i am waiting. thank you very much for yours hard working. Tested on my Dell Mini 10, everything workaround! but i can get Mint Splash Screen during start up, but i thing this is bug of my graphic card n EMGD driver. i thing this is the best linux distro in my GMA 500 machine. thanks! Fast, beautiful and THE replacement for GNOME 2. 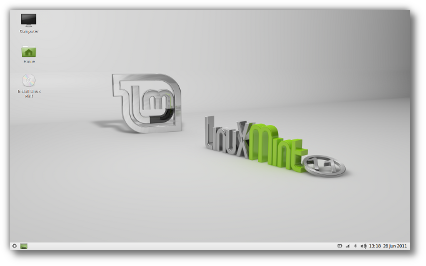 Linux Mint makes LXDE the best choice for a desktop OS. That wallpaper looks bad, though. Reminds me of something some kid would come up with after playing around with 3D Studio for an hour in 1995.
thanks.i have been waiting for this for weeks.i had font resizing issue in isadora/julia.i hope it wont happen in katya.and also,is there a plan of having an E17 flavor?thanks again. I have to admit, I’ve tried a lot of distros, but lately I always come back to this one! Congratulations on another job very well done! Heaping on the congratulations. Thanks for all your hard work. While waiting for this release I’ve delved more into straight Debian (which is good experience for a speedy OS but I wouldn’t recommend to someone who doesn’t like to delve). I really appreciate what you do the more. More and more. Geeat, thanks for this relase! 1. How to install that on USB? It requires to mount USB stick to “\” but from the installation window I can’t do it for LXDE edition (both mainstream GNOME and Debian XFCE allow to do it just fine). 2. How to disable ugly crappy overlay scroll bars? 3. When x86_64 version will be available? 4. Thanks, anyway. Lubuntu is my favorite UBUNTU edition and I like to try MINT LXDE, while being geeky to like MINT XFCE DE the most. I’d like to try MINT LXDE, just can’t (see #1). I just downloaded katya LXDE last night.It’s amazing,well done team! Hi. When u plan to publish x86_64 version? @TomG I don’t know why, but I’ve often had trouble keeping the items on the Gnome2 panel from moving around, even after I “lock” the panel. I’d like to see where that goes. Will there one day be a graphical control panel that users of any DE or window manager can use? It would be great if desktop and system settings were all in one place. Is it just for me or the memory usage has increased since Mint10 LXDE? Now it uses 160Mb with task manager launched, running in virtualbox. Excellent! Installé sur un (très) vieux portable pour mon fils. Tout marche parfaitement. Merci pour ce travail. Great thanks for Linux Mint, this is my new favorite OS. “Where is the 64-bit version” ? geeeeez, how many times do ppl have to ask? @62 phoenixandthor – I have a different problem. When I log into my machine, if I use the GNOME DE, I get several warnings about being unable to load certain panel items – always the mintMenu, and often other panel items. (And I am asked whether to delete them from the default setup). One solution I had read was to log out, then back in, but that’s quite aggravating – especially without a panel item to let me do that. I’m not sure what caused the problem, but it’s recent (within the last month or so). Hence, I’ve been using KDE or now LXDE. Excellent! Congratulations! A complete system, light and very easy to use. Thank you. The only problem I continue to have is two instances of the Mint Update icon running in the system tray. It’s been happening since RC1 on both my desktop and laptops. Let me know if you need further information and can anyone else confirm this issue? Yes, it’s really fast on my old computer. Faster than Windows XP. The choise of the out-of-the-box soft is nice. The new scrollbar is not irritating at all. I noticed something wrong with the sound. The high frequency seems to be slightly cut off. Both in Katya Main Edition and in LXDE. That’s strange, as I had no problems with the soundcard Realtek in Xubuntu 11.04. There were no problems in the previous Mint editions either. Though, it can be the issue of the old soundcard. In general, this relese is a success. 1.Linux Kernel 3.0.3 Stable / 3.1 RC2 i mean Must Put in New Editions To Be Best Linux Distro. 3.Best Wne and PlayOnLinux Must In Software For Beter Uses Windows Softwares In Linux Mint Editions. Why Contyrol Panel In My Audio Is Not Active? I Can Do Any Change Or Seting For Audio? Please You Jobs Be Beter Of All Other Distro In World.To Be Mint is Numer One!!! Best and Inovative Every Time 2 Steps Before Other Teams! Mint will be number 1 on distrowatch in the future thats for sure. For ADMIN Please Stop Deleting My Coment There!!! We Live in 2011 What is This Reasons? This is Not Friendly and Human. Great Mint But Heave Many Errors. Need New Cernel If This Compatibile in Mint. Other Please Return Instalation and Deinstalation In Windows Directory! We All Like Mint and Like Do It Best and Beter Distros. Heave Nice Day For Team na his Hard Work and Test. Note from the admin: Comments are only deleted when not constructive, aggressive or not respectful of others. Because of the huge amount of spam, an automated filter keeps your comment in a moderation queue the first time you comment on this blog. It might take a little while for some comments to appear, and sometimes it might happen a comment gets lost and treated as spam. It’s unfortunate but necessary to prevent spam. For more information on this please refer to the document of the antispam feature we’re using: “Akismet”. Testing the waters, and liking it…so far. Waited for a 64bit version of LXDE. Since none was forthcoming, I went ahead and installed LXDE via Synaptic on top of Mint Katya. Had issues with mouse clicks with the touchpad, a helpful post pointed me to gpointing-devices-settings. Now the touchpad does not drive me crazy anymore. I know, this is not a comment on mint LXDE, rather on LXDE on top of Katya. Nonetheless, I’m happy, because the gnome panel continuous crashing also drove me nuts. yes I’m a NewBie here but will you please tell me what wrong I asked in my previous comment. I just said to provide a link for India also as there are people who wants to try Linux. Isn’t it a disrespect?? or just tell strategy according to which these link are created? Note from admin: Nothing wrong. It just takes a little while for your first comment to be moderated. This is to fight against spam. When u plan to publish x86_64 version? I’m a former Ubuntu user since 10.04. After being informed of them changing desktops to Unity, I’ve decided to give you guys a try. I’m extremely happy with job you’ve done with Mint 11 LXDE–not only does everything work out of the box, it’s given my 7-year old desktop a second life. However, I did encounter some problems: Whenever I play an mp3 on Exaile and a video clip via Gnome MPlayer and/or VLC, it crashes and locks my screen where I have to reboot. Firefox [minus Moonlight] loaded perfectly without crashing, thus I hope the whole Flash issue gets resolved so that I can watch Hulu and You Tube vids again w/o using Windows. BTW Do the rough edges of LMDE version imply that you are constantly tweaking and recovering? I installed Mint 11 LXDE last night, it was way faster than my old Ubuntu 10.10. Just 2 problems: I couldn’t switch between the internal sound card and the USB Extigy. After reading tons of comments, I installed Pulseaudio and problem solved! The other major thing was the wireless card…then I read some comments about Dell cards…and “voilá”. Everything seem smooth now! @Jack: after I installed “b43-fwcutter” and “firmware-b43-installer” from Synaptic, I the system recognized my wifi card. Loving this release so far! The only snag I’ve run into is the double updater icon on boot. Anyone know how to fix this? Once I get that fixed this will be the perfect distro for my HP Mini! Instalei o LM-11-LXDE num DC1.ghz + 2gb/ram + 160gb/hd e está muito rápido. After doing initial updates the double notifier went away all by its self. So everything just works. Hooray!! I’m testing a live session right now. Everything seems to be fine except for the sound. It doesn’t work at all. Anyone now how I can get sound? The CDrom drive not showing up after I installed linux mint 11.. Any idea? Nice release, though I thought LXDE was a Debian base when I installed it. I’d install it on a bunch of computers we’re sending to a medical school in Haiti except for one quibble: the black Plymouth boot screen. These are old machines, average <1 GHz, 512 MB, and they do take their time booting. It looks like nothing is happening. It is going to be hard enough to convince the recipients not to blow pirated XP on to the boxen, so boot feedback is a very good thing. Personally I never had much use for Plymouth, I'd rather see a bunch of text scrolling by, I find it more interesting and less stressful. Also, there doesn't seem to be any way in the installer to make the machines boot directly to the GUI. I have been using Linux for 6 years, I can work around this on a personal machine, but it isn't something I want to mess with on 25 computers, so I'll probably opt for Zorin or something else. SturtUp-Manager crashes down immediately when being launched. PCmanFM crashes down each 15 minutes or so when opening a folder. Just a simple small folder at a simple doubleclick! Great job Linux Mint team. How easy is to install it for a beginner of Linux. Is it’s installation like gnome version or require manual disk partitioning. Is there a simple way of changing the virtual desktop size so I can have a desktop size greater than my monitor permits ? I have a Lenovo Ideapad and maximum resolution is 1024×600 at present. #2 on distrowatch! Sooooo close to knocking the all mighty Ubuntu off it’s perch. Great release! Thank you very much! Hey, Mint 11 is very nice. But how comes Mint LXDE uses 240 MB of RAM when just opened, and the Gnome version uses 215~220 MB!?? When using the processor, is it really lighter?